As the United States and the international community decide how to respond to the ongoing crisis in Syria, Russian President Vladimir Putin has not been shy about expressing his opinion. Last week, Putin addressed the American public directly with an op-ed in The New York Times explaining his reasons for opposing U.S. military action against the Syrian regime. But the Russian leader also touched on worries within his own borders. According to the Pew Research Center’s 2012 Global Religious Landscape report, there are about 14 million Muslims in Russia, comprising about 10% of the country’s population. A significant share of Russian Muslims live in Dagestan, Chechnya and other parts of the North Caucasus region, and some Islamic militants from that area have reportedly joined the fighting in Syria. Relatively few Russian Muslims support attacks on civilians in the name of Islam. A recent Pew Research survey showed that 86% say suicide bombing and other forms of violence against civilians are never justified, while 4% say they are sometimes (3%) or often (1%) justified. Of course, it only takes a small number to launch an attack, and Islamic extremists have carried out several in Russia in the past. In 2004, more than 300 people – including many children – were killed in a hostage crisis and massacre at a school in Beslan, Russia. About two years earlier, a militant group seized hostages in a Moscow theater, resulting in more than 100 deaths. 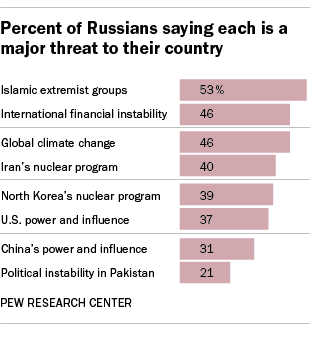 A 2013 Pew Research survey showed that about half of Russian adults (53%) think Islamic extremist groups pose a major threat to their country. More Russians express concern about Islamic extremism than any other topic tested, including international financial instability and climate change. Among Muslims in the North Caucasus region, more than half say they are either very concerned (32%) or somewhat concerned (25%) about religious extremism in Russia.